Lake Land College recently named ten outstanding non-traditional students of the year. 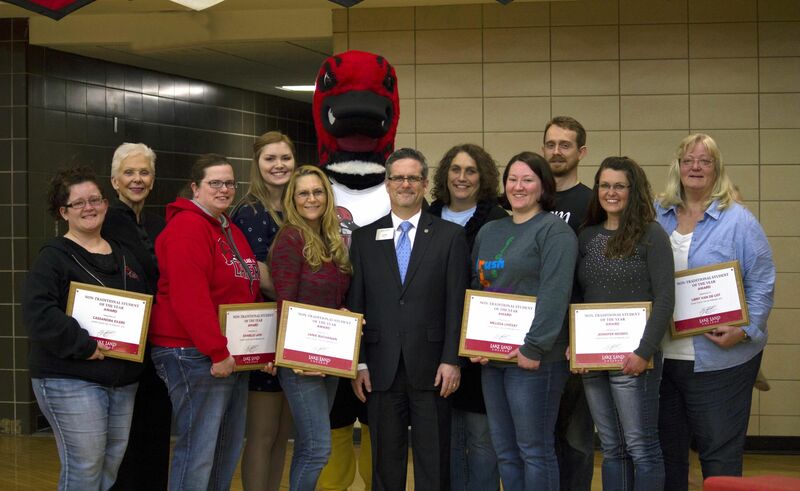 The awardees were recognized at the February 26 men’s and women’s home basketball games. They were Cassandra Eilers of Pana, Danielle Lash of Pana, Janie Buchanan of Bethany, Melissa Livesay of Paris, Jennifer Morris of Herrick, Libby Van De List of Effingham, Annette Lynch of Charleston, Leah Keagle of Arthur, Jackie Epley of Pana, and Clyde Powell of Charleston. This precedes the college’s Adult Week celebration that is scheduled for April 18-22. Lake Land will hold two events designed exclusively to invite adult students to explore their opportunities. New adult students, who register for summer or fall classes, may qualify for a tuition-free class up to three credit hours. The first event will be held on Tuesday, April 19 from 9 a.m. to 2 p.m. on campus. Individuals are encouraged to call 234-5429 to schedule a campus visit and meet with an academic advisor. The second event will be held at the Kluthe Center for Higher Education and Technology in Effingham on Thursday, April 21 from 4-6:30 p.m. Adults are encouraged to stop by the Kluthe Center and explore their options during this open house. To learn more about Adult Week, call Chris Strohl, Director of Community Outreach at 217-234-5429. More information can also be found at lakelandcollege.edu.